Staying Connected in the Rocky Mountains — Terra Consulting Group, LTD.
Terra’s Emma Herrick brings insight to the latest innovations in remote places. One of the most beautiful places in the U.S. is undeniably the Rocky Mountains. Within the Rocky Mountains in Colorado is my favorite place in the world: Vail Mountain. With over five thousand acres of skiable area and a vertical rise of 3,450 feet, Vail is a skier’s paradise. View at the summit of Vail Mountain. I still had cell service, even up here. Even though I tend to look for cell towers everywhere I go, I didn’t see many towers in the mountains. One of the reasons for this is many of the cell towers in these areas are disguised as trees, so as not to be obtrusive to the spectacular views in the area. These monopines may look odd from close-up, but from far away, they are nearly indistinguishable from the areas surrounding it. An example of a monopine: a cell tower disguised as a pine tree. How do tower companies get their equipment to the top of a mountain? It can be complicated. Some mountain locations, like the site in the photo below, are at lower elevations and have the benefit of an access road going up the mountain. Tower site in the foothills outside Denver, CO. The beautiful view from the site. Many ski resorts, however, tend to be in remote areas with high elevations and steep grades. To get to these resorts from Denver, there is only one highway: I-70. Even though it is a major highway, this road can be treacherous. From September to May, all commercial vehicles are required to carry chains for traction. The highway twists and turns through mountains and valleys and entire stretches of the highway can be shut down due to avalanches. Roads are icy and have steep grades, and there are runaway truck ramps every few miles. Highway I-70 going through a valley in the Rocky Mountains. The Eagle Bahn Gondola (shown) has a vertical rise of over 2000 ft.
For very steep mountains and those where the site location does not have an access road, helicopters may need to be used to bring large equipment. 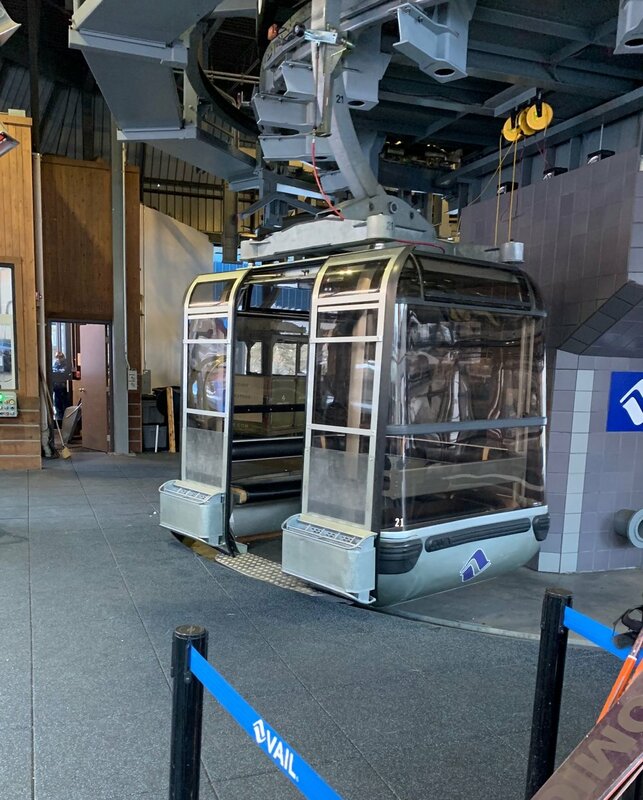 If the tower company has permission from the resort, smaller equipment may be brought up using gondolas. Gondolas have large cabins used to bring groups of skiers up to the slopes, and some of these gondolas have detachable cabins used to haul supplies up to the lodges on the mountain. In the towns at the base of the mountain, small cells help people stay connected. In 2015, Vail and its neighbor, Beaver Creek, hosted the World Alpine Ski Championships. In the lead-up to this event, Crown Castle installed 29 small cell nodes throughout Vail. You’d probably never notice them around the town, but these small cells help tourists and locals alike stay connected in a valley surrounded by huge mountains. In the last 15 or so years, Vail Mountain and others like it have gone from being areas that have virtually no coverage to being almost completely covered. From monopines and other macro installations servicing the slopes to small cell installations helping to cover the villages, anyone can stay connected wherever they are in the Rocky Mountains. Viewing Vail Village from the slopes on a beautiful blue-sky day.